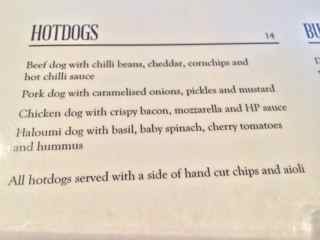 Beef dog with chilli beans (quite good) Haloumi dog with basil and Hummous (even better). 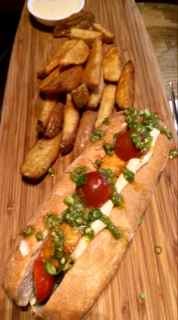 The Treehouse Bar has great lunch and mid week evening specials. 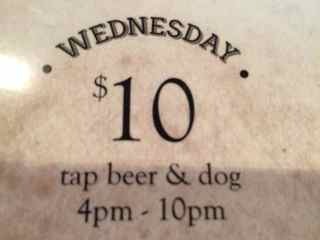 Recently the Wednesday night special changed from a $10 roller and beer/cider special to a $10 gourmet hotdog and beer/cider (wine if you’re lucky) special. 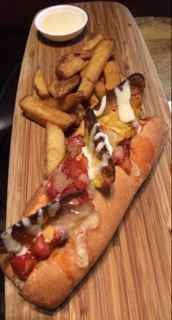 Not quite as good as the rollers, but the hand cut chips and aioli are still there and the chilli bean, pork, chicken and haloumi options still feature. Booking the booth upstairs overlooking the bar, is a great spot for a group.